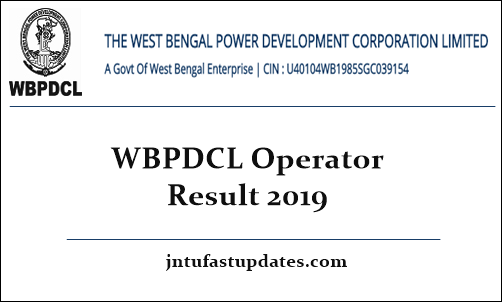 WBPDCL Result 2019: West Bengal Power Development Corporation Limited (WBPDCL) conducted the Operator, Technician, Office Executive, Assistant Teacher Examination on 20th January 2019. Aspirants applied for WBPDCL vacancies have attended the examination. As per the authority reveals, more than 50 thousand aspirants have competed for the operator examination. WBPDCL conducted the examination in many examination centers across the West Bengal state. WBPDCL Operator answer key 2019 PDF was released for all sets A, B, C, D soon after completing the examination. Aspirants who have competed for the WBPDCL operator examination can check the answer sheet and evaluate the probable score in the exam. All the hopefuls waiting for WBPDCL Operator, Technician, Assistant Teacher, Office Executive result 2019 can wait for few more days and stay checking the official portal, wbpdcl.co.in for the latest updates. West Bengal Power Development Corporation Limited (WBPDCL) recently announced the notification for 326 various posts of Operator/ Technician, Office Executive, Sub-Assistant Engineer, Staff Nurse, Assistant Teacher & Other Posts. A large number of candidates aspiring to get state government jobs in West Bengal have applied for the announced posts during the application dates. WBPDCL received a large number of applications from interested and eligible aspirants. While the selection process will be done through the written test and interview rounds. Candidates who clear the selection rounds with good merit will be shortlisted for the announced posts. All the competitors who have competed for the WBPDCL Operator, Technician, Assistant Teacher, office executive written test can expect the results in the month of February [tentatively]. The organization is expected to release the result after 3 to 4 weeks of the examination. Hence the competitors can wait for a few more days to check the results. Meanwhile, keep checking the WBPDCL website, wbpdcl.co.in for updates regarding the result date. The organization will release the cutoff marks/qualifying marks of the conducted examination. Candidates have to score the announced cutoff marks to clear the exam. WBPDCL Operator exam qualifying marks will be announced category-wise, and section-wise. Aspirants have to score the qualifying marks in all the scenarios to qualify in the written test round. Aspirants clearing the exam will get the chance to proceed with the interview round. WBPDCL Operator merit list 2019 will also be announced along with the result. Candidates scoring more than required cutoff marks will be listed in the merit list. Merit list specified aspirants are eligible to attend the interview round. On the homepage, “WBPDCL Result 2018” Link appears. Click on the link. The result gets downloaded. Check the result and take a printout for future reference. In which day wbpdcl result will be declared? Wbpdcl er je exam ta 20th January Holo tar answer key release hoache? ?